Brunch is my favorite meal of the day. If I had it my way, every day would be a weekend just so it could begin with brunch. Ahh, brunch! That perfectly timed meal – not early or efficient enough to be breakfast, but beating the lunch rush just enough. And the menu seems easier too, more laid-back and adaptable. It doesn’t hurt that brunch features what are arguably some of the best dishes of all time. Most of them are eggy, and could technically fall under the breakfast category, but instead of plain old scrambles and such, we have the time to linger on something just a bit more involved. Frittatas, anyone? Or waffles? Or (my pick every time) french toast? Yes, please! 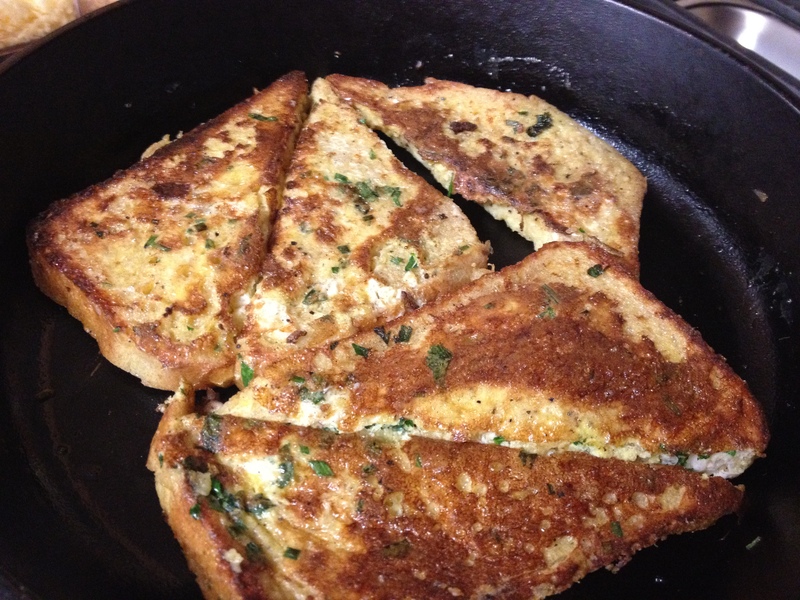 This savory take on french toast is a recent adaptation of mine. I was inspired by a recipe on salt/pepper french toast, which seemed like a novel idea perfect for tweaking. I took my love for chili cheese toast – one of the best appetizers ever! I can never resist ordering it if it’s on the menu – and decided to put my own spin on the recipe. This french toast is both light, fluffy, and wonderfully flavorful, and is especially great if you prefer a salty rather than sweet start to your day. In a bowl or baking dish, beat together eggs with half-and-half, salt, pepper, chilies, green onions, and cilantro. Heat a medium or large skillet over medium-high heat. Cover the bottom of the skillet with vegetable oil and add a tablespoon or two of butter for taste. Dip the bread triangles into the egg batter, drain off any excess, and place straight into the hot pan. Fry for 2 to 3 minutes on the first side – you want to develop a golden-brown color and the texture should be crispier than traditional French toast. Flip the French toast and now cook the second side for another 2 minutes. 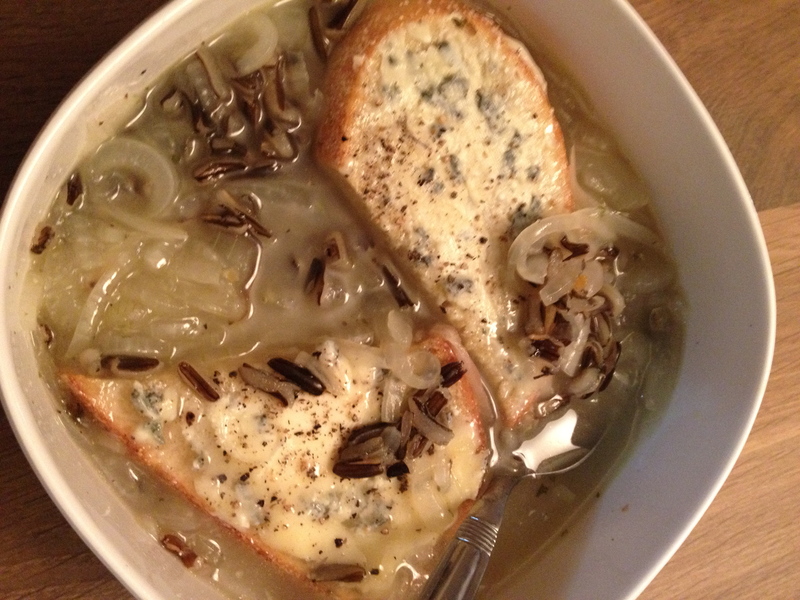 While it’s cooking, sprinkle a little grated cheese over the toast. Let it get nice and melty. Place cooked toasts on a paper towel-lined plate or rack to drain. Serve toasts warm with a side of ketchup. This is the tale of two pies. Or rather, one pie, attempted twice. My mother has long been our family’s apple pie hero. She brought them to countless dinner parties, baked them on a whim, and they were always flawless. 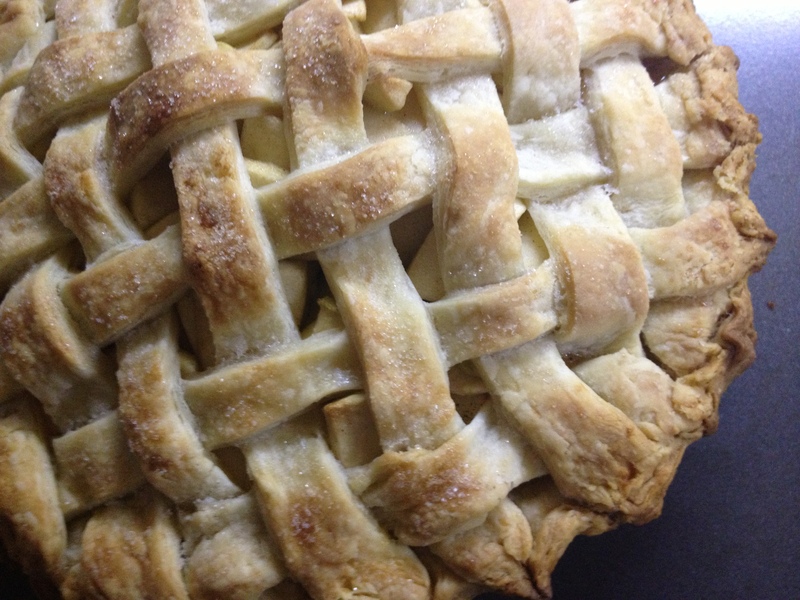 So on her most recent visit, it was clear that we should attempt a joint pie-making venture. Except…instead of using her recipe, I wanted to use two different ones (one for the crust, and another for the filling). And that’s when the trouble began. The pie was beautiful, no doubt. The crust was amazingly flaky, and perfectly buttery, and even my mother decided she was going to adopt this as her new crust moving forward. The filling, well, that was another story. I will spare you the sordid details, but suffice it to say that with a few missteps along the way, we produced a first version that was spectacular to behold, but impossible to slice. The insides were more liquid than apple and had to be ladled out of the pie pan. It was not pretty. But we soldiered on. The very next week, round 2 of the apple pie wars was attempted. This time, we decided to stick to the filling recipe provided (with no little…ahem…creative interpretations on our part – oh, we should cook the apples first! or marinate them in sugar to draw out the juices! and other such misguided notions). So imagine our dismay when, cutting into the baked pie, we discovered…a liquid mess. Again. It was almost too much to bear. We left the kitchen in disappointment. The next morning, I dragged my dejected self over to my beautiful pie, and the pool of apple juices was gone. Nowhere to be seen. And I sliced the pie, and it was perfect. The slice was so perfect, I could have cried. But instead, I ate it. So take this as a hesitantly cautionary tale. The recipe works. But if you seem close to a liquid apple pie disaster, just be patient, and try again tomorrow. If that seems just too risky a proposition (and I wouldn’t blame you), then this pie crust recipe is amazing enough in its own right and should work with any other fruit fillings you can concoct. Pack it up: Divide the dough in half, and place each half on a large piece of plastic wrap. I like to use the sides to pull in the dough and shape it into a disk. Let the dough chill in the fridge for one hour, but preferably at least two, before rolling it out. I’ve been quite enamored with my cast iron skillet over the last two years. I shower it with love, via multiple generous rounds of careful oiling, and I take great pride in how well seasoned it has become since I began using it. In a short time, it has become more of a workhorse in my kitchen than any other pot or pan. I’ve heard that in some families, the cast iron skillet can become a family heirloom passed down through generations, and I can see why. Not sure my son will want this skillet in 20 years, but I’m going do my darnedest to make it so. My current favorite use for my pan is griddle cakes of every kind. That’s just a fancy name for fritters, which in turn are just a fancy name for patties. 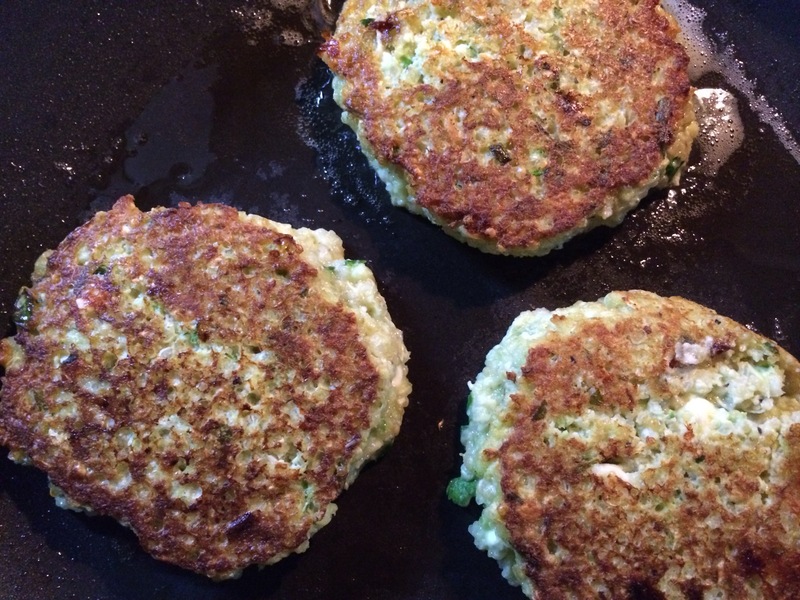 I try to use whatever vegetables are in season (leeks! sweet potatoes! beets! ), pair them up with some grains, bind everything together with an egg or two, and that’s it. A quick, healthy and perfect meal. Made even better by the fact that they heat up very easily for lunch the next day. Make a quick dipping sauce and you’re set. (Or, if you’re my father, just dunk it in Sriracha, the sauce for all seasons in his opinion, and call it a day.) I’m including the quick cilantro tahini sauce I made this time, but I’m sure there are other equally good options. 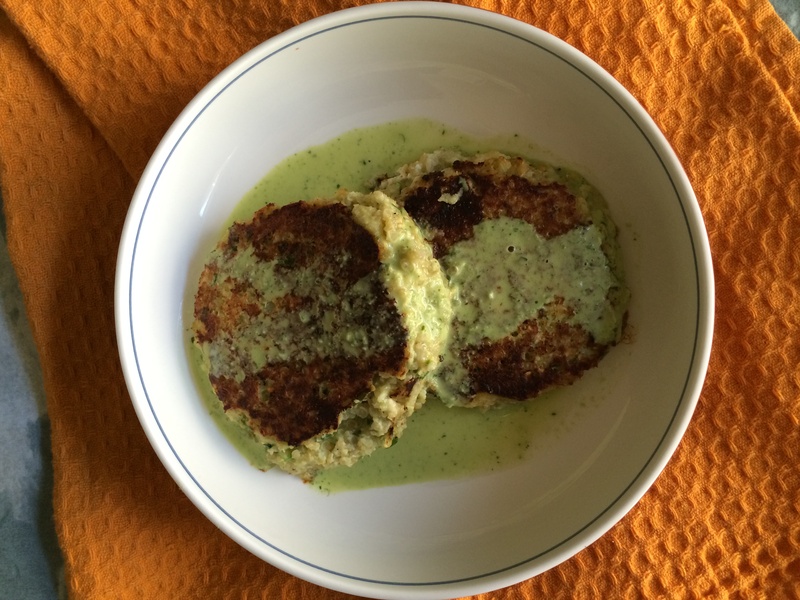 These patties are particularly great because they are a protein powerhouse – quinoa, eggs and feta all in every bite. Enough to put a little extra pep in your step. Isn’t it great when what’s good for you tastes so good? Rinse the quinoa. Put the quinoa and 2 cups water in a medium pot. Bring it up to a boil, add a pinch of salt and pepper, turn it down to a simmer and cover and cook for 15 minutes. Fluff with a fork, turn off the heat, and set the lid ajar to rest. In a food processor, pulse the cauliflower until it resembles cous cous. In a large bowl, whisk the 4 eggs together well. Add the cauliflower to the eggs. Now add the scallions and oats to the food processor and pulse a few times to roughly chop. Add this mixture to the egg bowl, along with the cooked quinoa. Add a generous pinch of salt and pepper, the crumbled feta, lemon zest, chopped cilantro and stir to mix well. Let the mixture rest in the fridge for 30 minutes. In a small blender container, combine ¼ cup cilantro, ¼ cup chives, 2 tbsp well-stirred tahini, 1 tbsp lemon juice, a dash of white wine vinegar, ¼ cup olive oil and 1 chopped garlic clove. Salt and pepper to taste, and thin with a little water if desired. To anyone who’s bothered to read through my posts/recipes so far (ha! ), it may have become clear that I am borderline obsessed with yogurt. Particularly the Greek variety, but honestly, any kind of yogurt will do. I am one of those in the “yogurt makes everything better” camp. And this is not a recent trend. Those who know me well know that this love for the curds and whey began deep in my childhood. I had a disturbing pattern of topping pretty much every meal with a dollop of yogurt. Soon, people began to simply look away when I reached for the yogurt container. This is true. Now that I’ve said that, don’t be too quick to dismiss this recipe. Yes, I was initially drawn to it because it had the word yogurt in the title. But if I came for the yogurt, I stayed for the amazing confection that emerged from my oven. Baked yogurt (with a little help from its friend in the dairy department, condensed milk) is so much better than you would expect. It has a texture that most resembles cheesecake, without the eggs or fat that usually accompany such desserts. Plus it’s exponentially easier to make. Pretty much the perfect anytime dessert. Great for a weekend dinner with friends, or frankly, a great breakfast for yourself the next morning. Have I sold you on this yet? This can be made in one large dish or in individual ramekins if you want to make for a nicer presentation. Topping options are endless. Any of your favorite combos of fruit/nut/other crunchy things will be delicious on this base. Pour the yogurt into a sieve and leave this to sit covered over a bowl for at least an hour in the refrigerator. This will drain off the excess liquid in the yoghurt and leave you with a wonderfully thick and creamy mixture. Alternately, you could use Greek yogurt, which is already strained and thick, and you will cut your prep time in half. Preheat the oven to 350 degrees. In a large bowl combine the thickened yogurt and the condensed milk until smooth. Pour into a medium sized baking dish or individual ramekins and bake in the oven for 20-30 minutes until set. Baking time will depend on the size of the dish used so keep an eye on the cooking time. 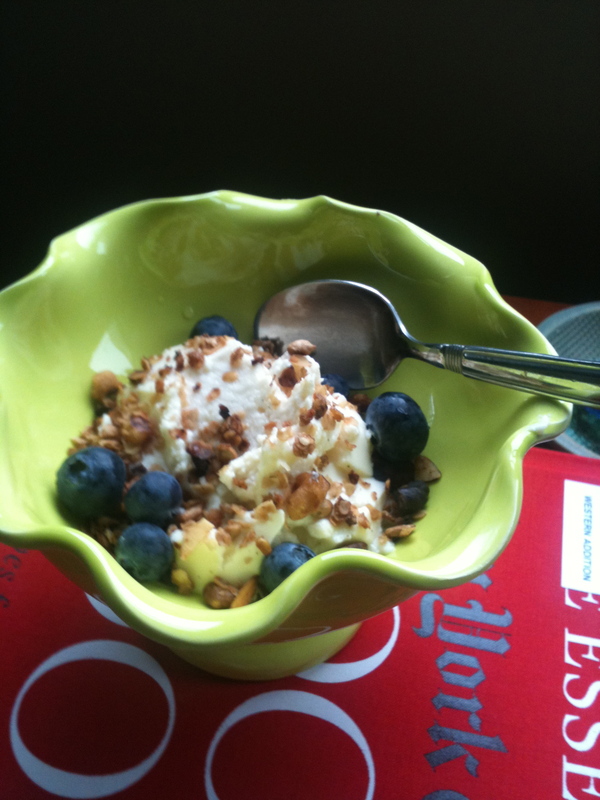 Serve the baked yogurt while still warm topped with the honey, fruits and nuts. Or alternatively the yogurt can be baked ahead of time and served cold from the fridge.